“Very informative and a helpful and fun way to study materia medica!” — Wendy Jensen, co-author of the New World Veterinary Repertory. 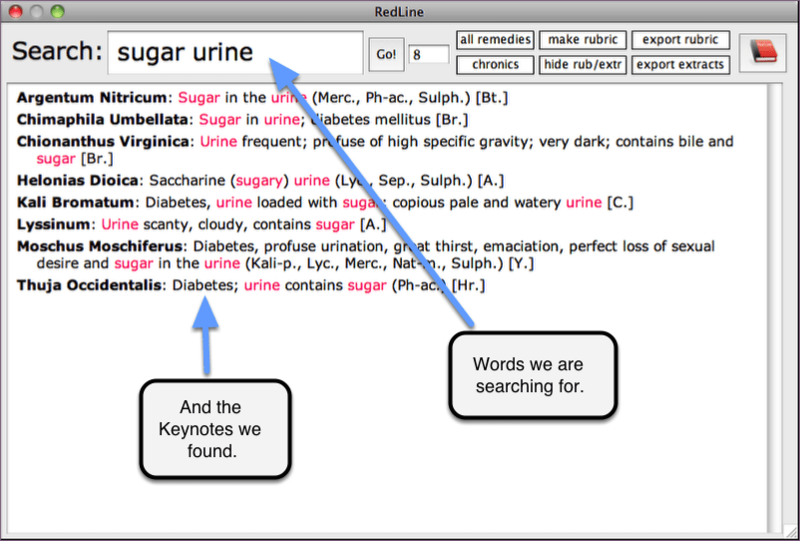 This is a Mac computer application that allows us to study and search one of our important references — the Keynotes & Red Line Symptoms of the Materia Medica, by Dr. Adolph Von Lippe. This very respected work is unique in that it focuses on keynote symptoms. Keynotes, as these symptoms are called, are ones that strongly suggest certain remedies. For example, there are symptoms that are included in the action of many, perhaps dozens or hundreds, of remedies. Keynote symptoms are more restricted than this — either there are few remedies that have this symptom, or this is a symptom that is very strongly expressed by that remedy, or is very frequently manifested in patients needing that remedy. To emphasize this, here is a summation for the significance of the keynote symptom. Very few remedies have this symptom at all (a rare symptom). Few remedies have this symptom so strongly expressed in the patient. A patient having a very persistent and recurrent symptom is often showing a keynote indicating a small number of remedies. How were these keynote symptoms found? All the effects of substances (remedies) came from provings, from testing the substances in healthy individuals. Using this body of knowledge, practitioners were gradually able to identify these especially useful symptoms, the keynotes, from clinical experience. The book mentioned above, Red Line Symptoms, is the fruit of over 100 years of clinical experience in which these keynotes were identified. Adolph Lippe organized this information bringing together this invaluable knowledge into this reference text. Lippe’s Red Line Symptoms is the foundation for this application. This database is emphasizing, as the foundation, the book by Adolph Von Lippe entitled Key Notes & Red Line Symptoms of the Materia Medica which was first published in the 1800’s. It is a compilation from clinical experience which identifies the primary indications for remedies — the keynotes. It is a very valuable work to complement our other sources, such as Hering’s Guiding Symptoms of Our Materia Medica or Allen’s Encyclopedia of Pure Materia Medica which are based primarily on provings of substances. The identification of keynotes follows from applying this proving information in clinical practice. The outstanding and guiding symptoms which lead to a remedy are identified as keynotes which you can think of as a level higher than guiding symptoms in that keynotes are restricted to fewer remedies. When these outstanding symptoms are seen in a patient these few remedies are put forward for consideration. 1. The Elements of a Synthetic Materia Medica by C. M. Boger, M.D. 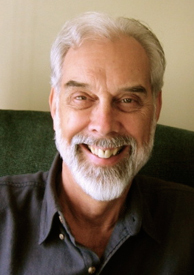 which is a listing of his discoveries of keynotes from clinical practice. It is found in C. M. Boger: Collected Writings edited by Robert Bannan, Churchill Livingstone, New York, 1994, pages 129-145. Approximately 320 keynote symptoms were added from this source. 2. The Journal of Homoeopathic Clinics; Being A Collection of Clinical Cases, Characteristics, Etc., edited by Constantine Hering, M.D. and Henry Noah Martin, M.D. Originally published by the Hahnemann Medical College, of Philadelphia in 1869 and republished by The New England School of Homeopathy, 1990, volumes I and II. Interspersed in these journals are listings of designated characteristic symptoms, a total of 492 symptoms that were shown to be of particular use in clinical cases – thus becoming of keynote significance. Some of these characteristic symptoms have author attributions and I put them in when I could (when recognized), however the majority do not have authors listed and I have assumed them to be Constantine Hering (as he was the chief editor) and thus listed them that way. 1. Jahr’s New Manual (or Symptomen-Codex), translated with extensive additions from various sources by Charles Julius Hempel, M.D., aided by James M. Quin, M.D., published by William Radde of New York, 1848. 2. Complete Repertory of the Homeopathic Materia Medica by Charles J. Hempel, M.D., published by William Radde, New York, 1853. This work is volume III of the three volume work published by William Radde at this time, and as stated by Dr. Hempel in the Preface to this volume “This repertory is more particuarly intended as the third and concluding volume of the Symptomen-Codex, nevertheless it can be used in connexion with any homeopathic manual in existence.” Clinically confirmed symptoms are emphasized in this work. 3. Allen’s Handbook of Materia Medica and Homeopathic Therapeutics, by Timothy Field Allen, M.D., reprinted by B. Jain Publishers, New Delhi, in 1981. As discussed in the Preface, “The preparation of this handbook was commenced immediately after the completion of the Encyclopedia, and in accorance with a desire, strongly and unanimously expressed by a number of prominent physicians…to possess a condensed volume for ready reference. The first labor undertaken was to correct the errors and supply the omissions which to some extent marred the Encyclopedia. This work proved to be gigantic, involving as it did, a review of nearly every symptom in comparison with the originals. The whole Encyclopedia could, almost as well, have been recast. To this revised material have been added most of the provings and many cases of poisoning which have accumulated during the past ten years, omitting only such as seemed to rest upon a doubtful basis or which would not be of any practical value.” Many of the remedies have added to them very valuable clinical indications. As author of this program I am interested in adding symptoms that from my experience are potentially useful symptoms for my cases. These are primarily from study of materia medica – symptoms of which strike me as interesting, indicative, and would likely flag this remedy for me. The sources used for this information are primarily Hering’s Guiding Symptoms of Our Materia Medica [HGS], Allen’s Encyclopedia of Pure Materia Medica [AE], Allen’s Handbook of Materia Medica and Homeopathic Therapeutics [AH], and E. B. Nash’s Leaders in Homoeopathic Therapeutics, Regional Leaders, Leaders in Respiratory Organs, Leaders in Typhoid Fever, Leaders for the Use of Sulphur, The Testimony of the Clinic [NL]. These sources are noted in the author list and also in the text itself. These will all be symptoms not orginally included in Lippe’s work. There are also some characteristic symptoms I put together from reading more than one source and the notation is then [Pit.]. This does not mean that I, necessarily, have clinical confirmation of this symptom, rather that I have selected it as being, in my opinion, a guiding symptom for the remedy, one I want to remember. 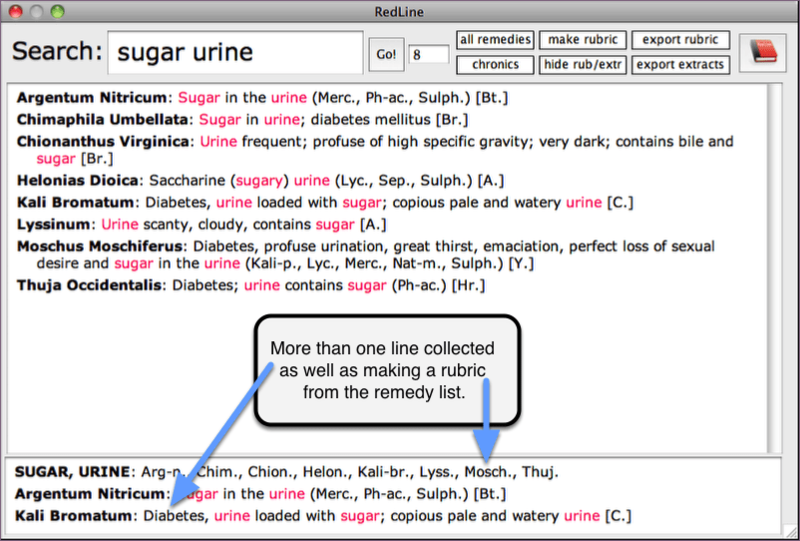 The source text I used for Lippe’s Red Line Symptoms (as it is usually called) has many errors in the copy — misspellings of words & of remedies, use of older remedy names (again often spelled differently than the contemporary texts), and also some old medical terminology not recognizable today. 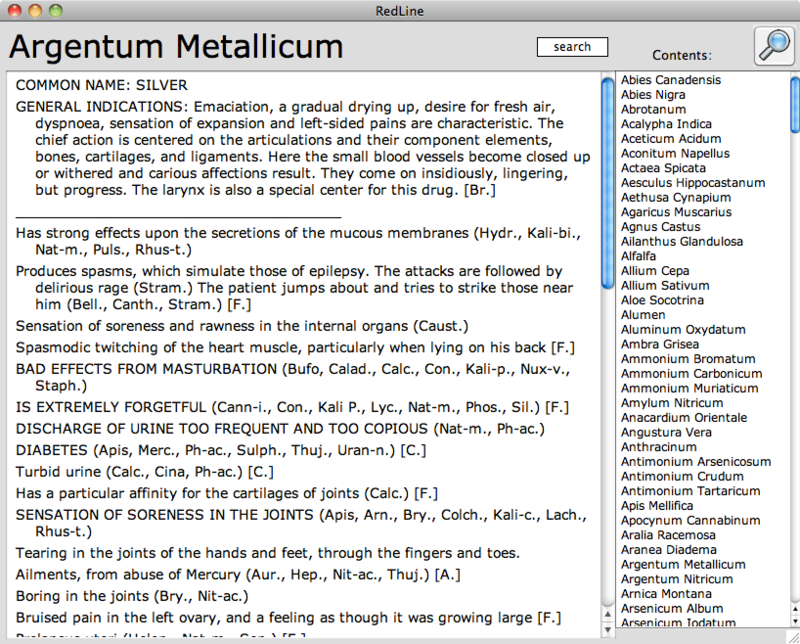 Considerable time was put into correcting text, checking remedy inclusions with materia medica, updating remedy names and spellings, and either changing the older medical terms to contemporary words or defining the term in footnotes. Regarding the latter, you will notice in the text that some of the words have numbers after them, such as (1) or (2) which refer to footnotes that appear at the bottom of the remedy entry. I examined what books I could find to see if the same errors were there and all those I looked at were the same. I also find the same errors in the file included in ReferenceWorks. I assume there was orginally an accurate text (perhaps now a rare book) and that these errors were introduced as subsequent copies were made. In any case we now have a much more accurate text to work with in this database. The information for the 347 remedies included in this database can be studied just as in a book. 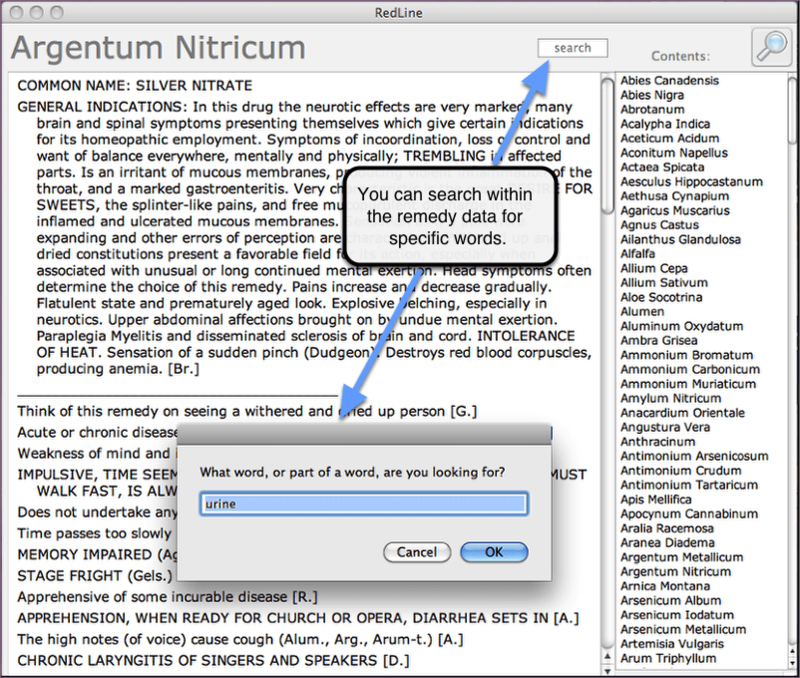 In this picture you will see the remedy names listed on the right and by clicking on that name you will be taken to the keynote listing for that particular remedy. To make remedy study more useful it seemed that it would be helpful to also have some general indications for each remedy — what kind of illnesses it was primarily used for. To supply this the General Indications were taken from Boericke’s Pocket Manual Of Homoeopathic Materia Medica. 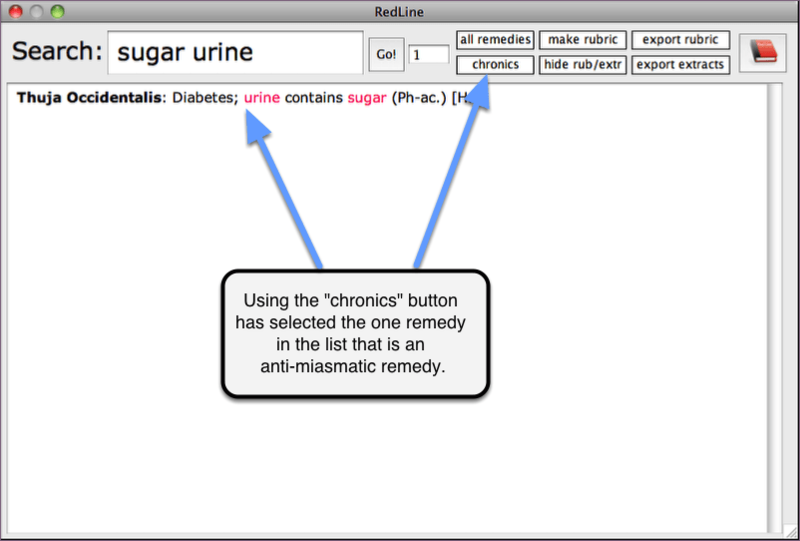 This information is at the top of each remedy listing and separated from the keynotes by a line. For convenience you can also type in the first letter of the remedy name to be taken down the list to find the remedy of interest. For example you could type the letter “M” to be taken in the list to where the remedies starting with the letter “M” begins. 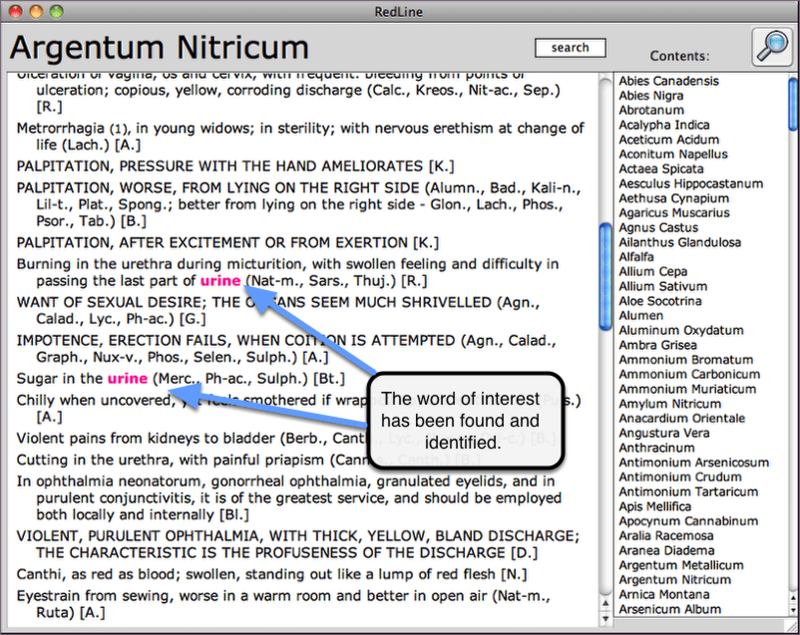 If you have interest in a particular word in the information for a particular remedy you can use Search button to the right of the remedy name. The other, even more useful function, is searching the entire database, all the remedies, for particular symptoms. Say you have a patient diagnosed with diabetes and you have confirmed that there is sugar in the urine. You can put these two words in a search field and look through all the remedies to find which ones have this as a keynote. If any of these listed remedies interest you, the line can be clicked on and you will go to that specific remedy entry where you can study it further. In this next picture we see how it will look after clicking the first line in the search results, for the remedy Argentum Nitricum. Back to the page with our search results (click on the magnifying glass icon, upper right), there is more we can do with the information so let’s go through these options. There is a button to click that will go through the list of found remedies and re-list only those that Hahnemann & Boenninghausen identified as antipsoric remedies. This can be very helpful in some clearly chronic cases. In addition to the antipsoric list of Hahnemann (about 50 remedies) two other remedies have been added to the list to represent the other miasms — Thuya and Mercurius. 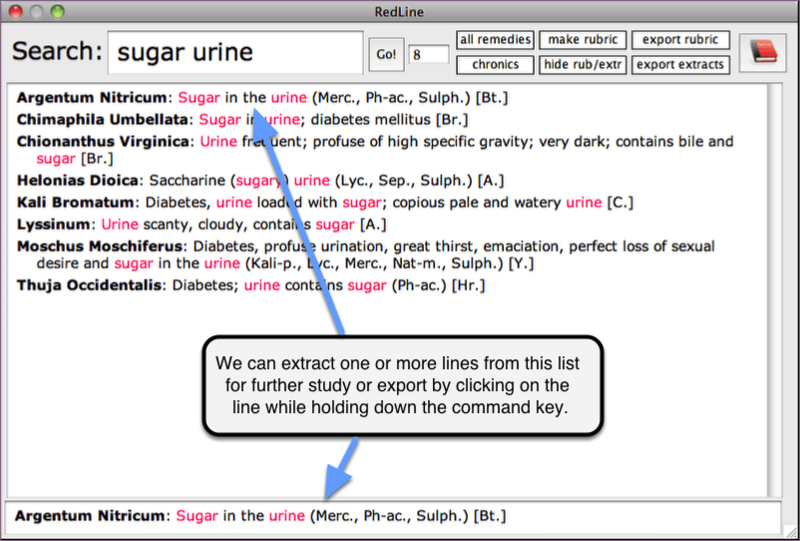 Here the use of that feature has been done with our search for urine sugar. You can return to the “all remedies” list when you wish to see it again — you can toggle back and forth. If you have a list of found remedies that interest you it can be made into a rubric which can be exported for other use. Before that is done it can be useful to edit the list, take out the remedy lists that are not appropriate. A line may have been found that has the search words but is not relevant to your intention. If you hold down the shift key and click on it you can delete that line from the search. After you are satisfied with the results, then click on the “make rubric” button to make the rubric. If you toggle back to “all remedies” the rubric will adjust itself accordingly but the lines you deleted during your editing will re-appear so save your extracted information first (see below). There is also a way to save complete lines from the search field. It is accomplished by using command-click on each line of interest. This will enter each selected line into the rubric box. Rather than subtracting lines you don’t need, by using shift-click, you will be collecting lines you DO want, when you use command-click. The reason for this function is so you can select lines from any of the search results you get. 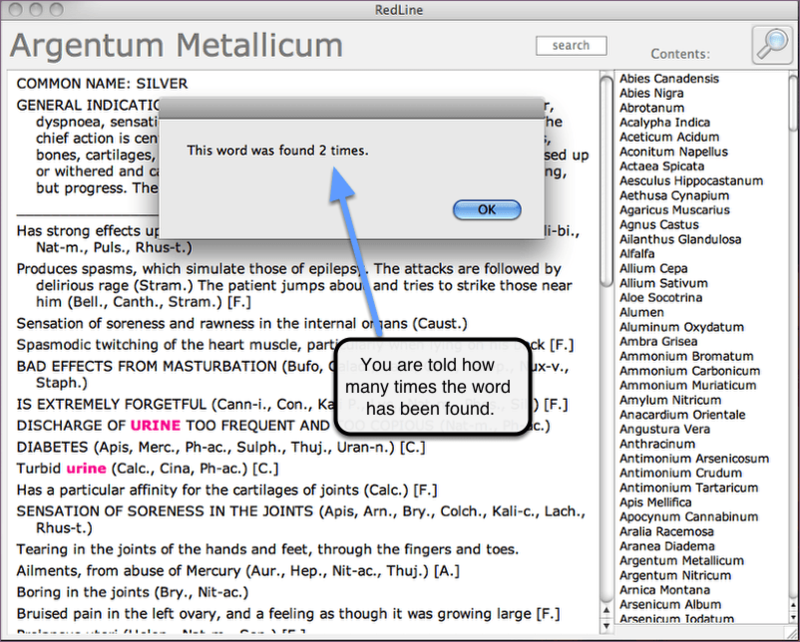 You can even collect lines from more than one search. You are able to search as many remedies as you wish, saving whichever lines are of interest as you go. As long as you don’t “hide” this field by clicking the button for “hide rubric” then the selected lines are stored in the rubric box until you export them. 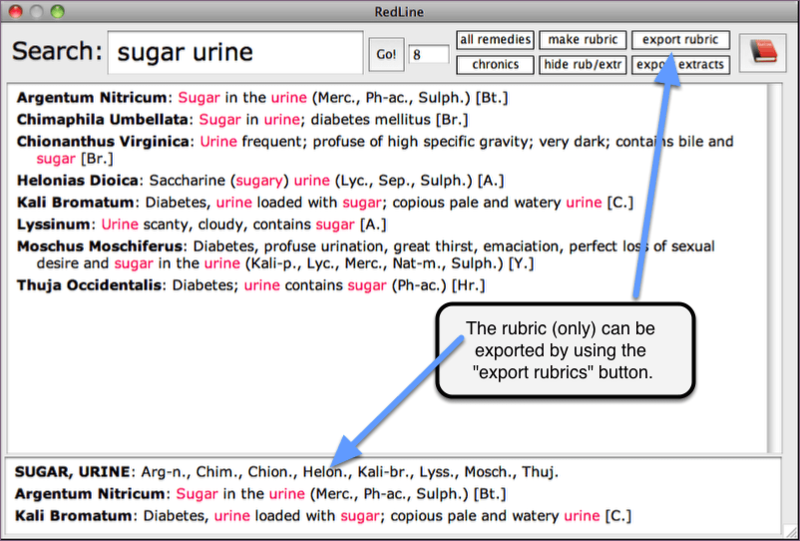 Also at any time you can add a rubric to what you have collected so that you can have both a rubric and also saved lines together — and export both the rubric and the selected lines (separate exports) for your later use. See this next picture of an example of this. Using this method of selection is nice for comparing remedies that all seem correct, but have subtle differences in the wording which are actually very important at times. 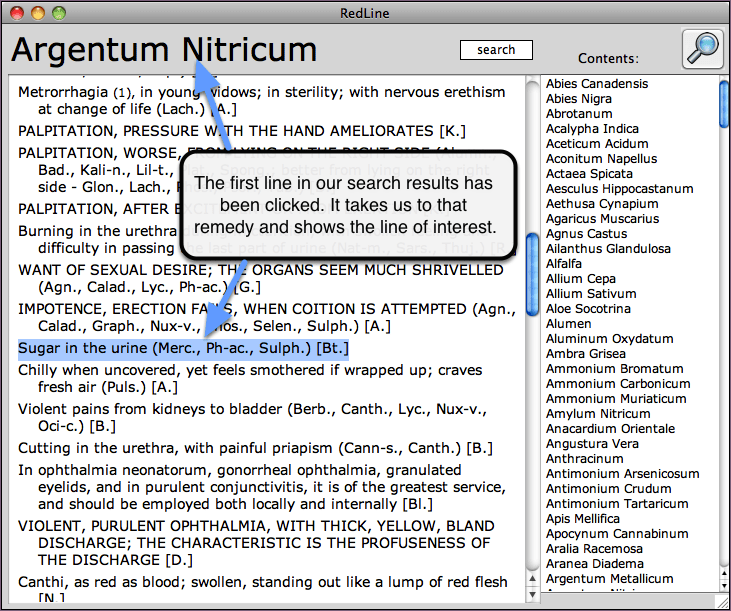 If you want to keep a rubric for your later study or use, then use the “export rubric” button and only the rubric will be put in the computer clipboard so it can be pasted into a text document or into a MacRepertory clipboard (click into an open MacRepertory clipboard and use “command/v” to paste into that clipboard). If you put it into MacRepertory then it can be used as a rubric like any other. Sometimes restricting the analysis to this one rubric can be useful as you are restricting consideration to just the keynote remedies. Yes, as you see in this last picture, there are some color choices for the background of the app. There are several shades of gray and then these OUTSTANDING colors like you see in this picture. Nice to have some choices, right? This pretty much covers the major functions of the program. It is a great study tool and often very useful in cases that are difficult to solve. I hope you find it useful and enjoy it.